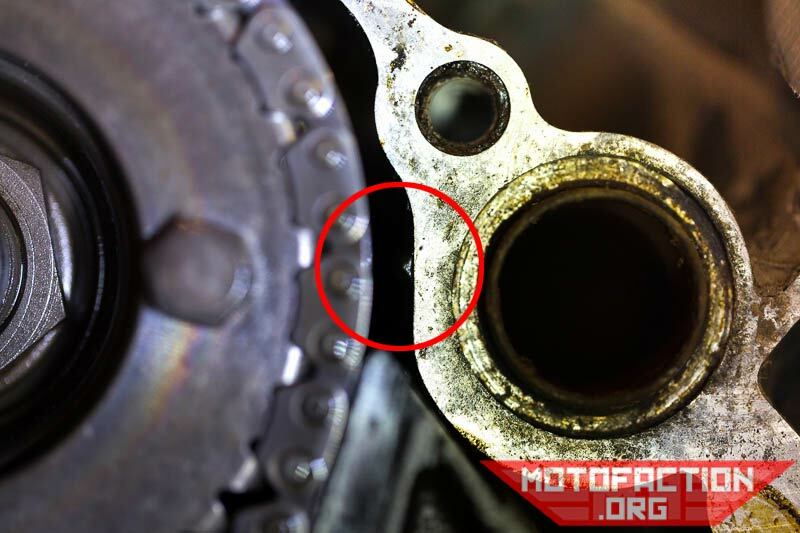 Need to remove your cam chain, or double check that the orientation of your cam sprocket in relation to your crankshaft is correct? Here's the procedure. 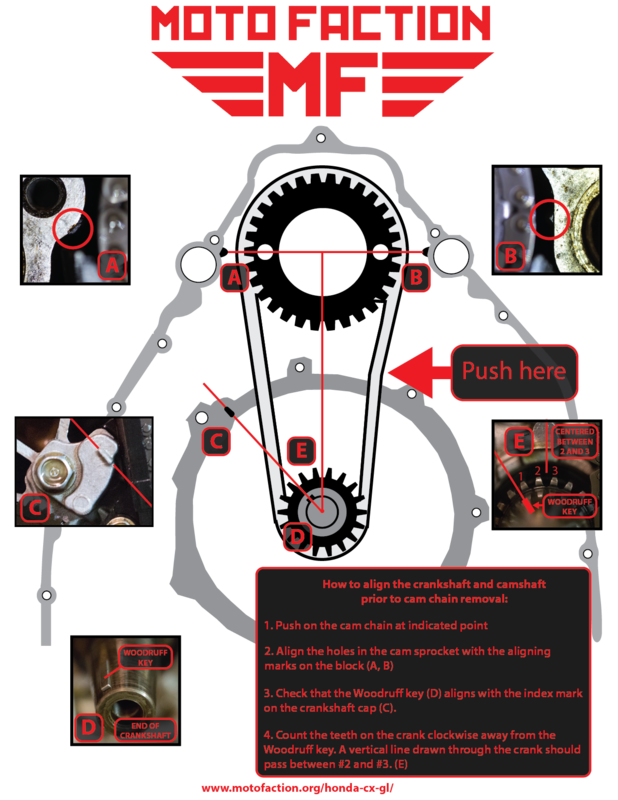 Doing this before you remove your cam sprocket and cam chain to change it out is a good idea as if you don't move either the camshaft or crankshaft while the chain is off it should be quick and easy to verify that you put the cam sprocket back on in the correct alignment with the crankshaft. This assumes that you have already removed the tensioner mechanism, tensioner blade and cam chain guide. Push in against the cam chain so that it is taut where the tensioner blade usually pushes, imitating the effect of the tensioner blade. 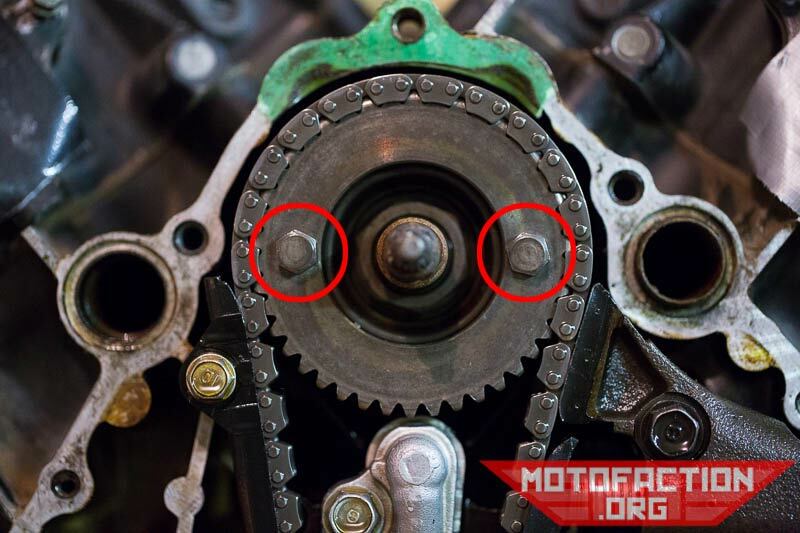 Rotate the crank/camshaft until the holes in the camshaft sprocket line up with the index marks on the inside of the crankcase on either side (9 o'clock and 3 o'clock). These holes will be filled with bolts if you're pre-emptively setting the timing before taking off the sprocket/cam chain. Count the teeth in a clockwise direction from the Woodruff key. 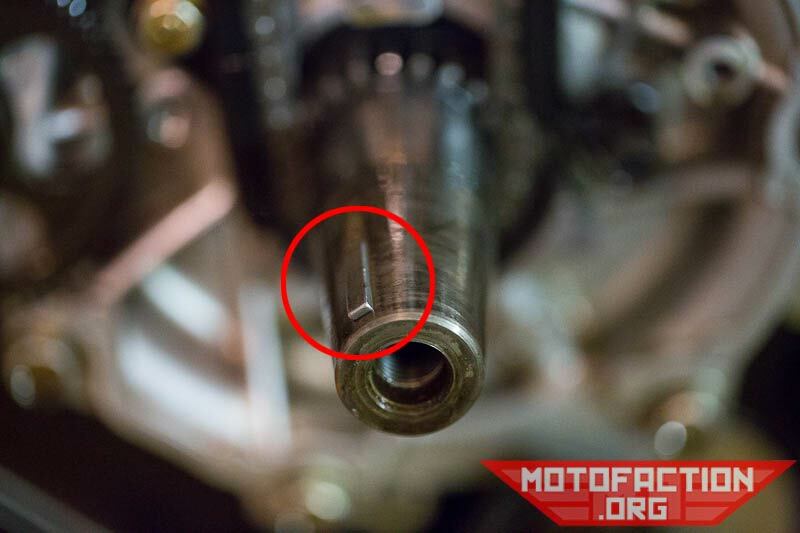 A line drawn through the center of the crankshaft vertically should pass through the gap between the second and third teeth. 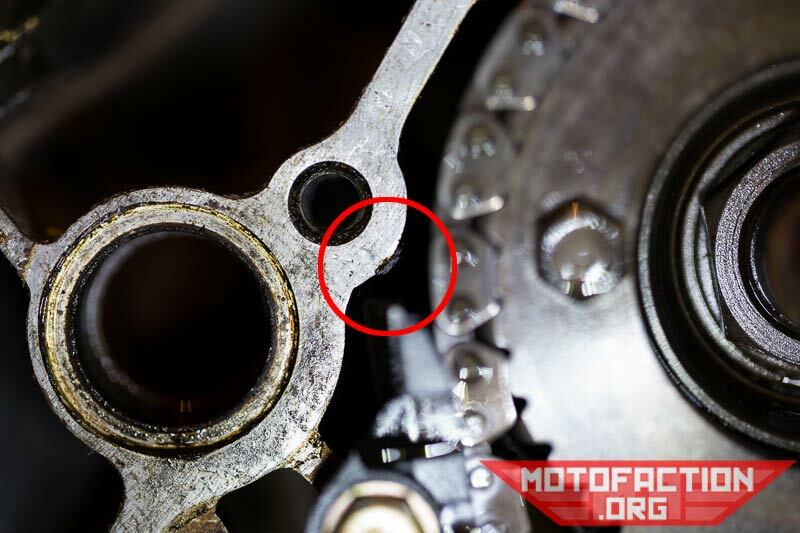 If all of those things line up correctly, your valve timing is set correctly. 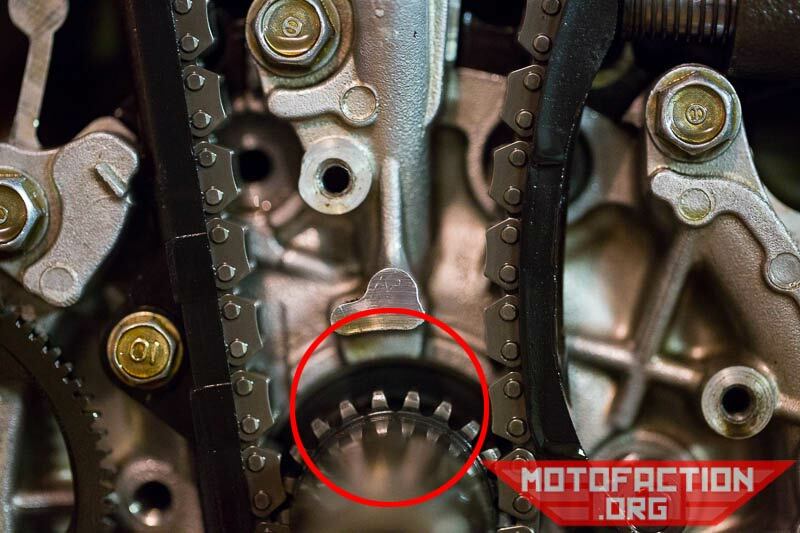 If you are about to remove your cam sprocket and chain, don't move either the crankshaft or camshaft from this point to make your life easier upon reassembly! Note that since the timing is drawn from the crankshaft and not the camshaft you can't have the valve timing be 180° out, so no need to worry about that. If you're doing this as part of the triple or quadruple bypass, click here to go back to the bypass page.